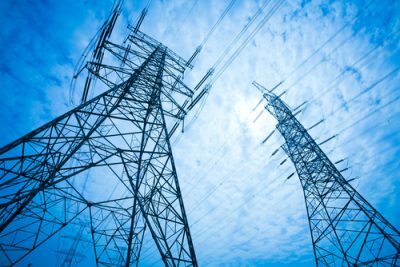 China’s continuing shift to green sources of electric power generation is confirmed in the latest data published by the National Energy Administration (NEA) and the China Electricity Council (CEC). New capacity additions in the first half of 2017 have seen the proportion of capacity added sourced from water, wind and sun (WWS) reaching 70%, with thermal capacity added being reduced to 28% and nuclear to just 2%. Overall, the China electric power system has swung from one that was dependent on WWS sources for just 20% in 2007 to 35% in 2017 (1H) – an astonishing 15% swing in just a decade. Meanwhile actual electric energy generated in 1H 2017 remains heavily dependent on thermal sources to the extent of 75%, with WWS accounting for 21% and nuclear for 4%. The system is greening at the margin (in terms of new additions) but it still remains a large fossil-fuelled system. China’s energy-related agencies, the National Energy Administration (NEA) and the China Electricity Council (CEC), have released data on the operation of China’s electric power system in the first half of 2017 (1H 2017), noting that renewable sources (water, wind and sun) accounted for 69.8% of new capacity added, with thermal sources (mainly coal) accounting for 28%, and nuclear just 2% (Fig. 1). These results reveal a marked shift towards green sources of electric power, when compared with the 2016 data which recorded that renewable sources (WWS) added 51.9% of new capacity, while thermal accounted for 42.9% and nuclear for 5.2%. The first half results for 2017 thus reveal that the electric power system is continuing its green shift, with WWS sources increasing their influence and thermal sources declining in proportion. The trends therefore continue those analyzed previously by Dr Hao Tan and myself – see here. The 2017 data also reveal that the absolute numbers of new capacity additions are down on 2016, with total capacity added in 1H 2017 standing at just 50.6 GW, compared with 124.6 GW capacity additions for the whole of 2016. This is consistent with a general cutback in investment levels across the economy in China in 2017. WWS sources accounted for 35.3 GW in 1H 2017 – or nearly 6 billion watts per month. By contrast with the capacity additions in 2017 1H, the actual electrical energy generated over the first half of the year stands at just under 3000 TWh (which is comparable with the generated amount in the full year 2016 when compared over the same time scale), with WWS sources accounting for 21%, nuclear for 4% and thermal for 75%. This may be contrasted with the 2016 full-year results, which were that thermal accounted for 71.6%, WWS sources for 24.8% and nuclear for 3.6%. Thus in terms of electricity generated, the year 2017 has so far seen an increase in the proportion of thermal power generated and a corresponding decrease in WWS power, with nuclear marginally increasing its proportional contribution. This result reflects the continuing strength of fossil fuels in the total electric power system, and is also likely to be the effect of continuing curtailment of renewable sources (i.e. generating power but not contributing to the grid) – as discussed in the final section below. The system is greening at the margin (in terms of new additions) but it still remains a large fossil-fuelled system. When we turn to examine new capacity additions and investments in WWS sources in 2017 (1H) we see that the green shift continues to operate at a level that far exceeds what is found elsewhere in the world. The 23.6 GW new solar PV power capacity added in 2017 (1H) is another world record for China, taking the cumulative installed capacity to 101 GW by end of June 2017 (and to 112.3 GW by July 2017– which is already above the (conservative) target of 105 GW set for 2020 by the ND&RC in its 13th FYP for energy). Some observers like the AECEA see China’s solar PV installations as likely to top 40 GW in 2017 for the full year – see here. The AECEA projects the 2020 cumulative total for China as likely to reach 230 GW, which would dominate the global picture. 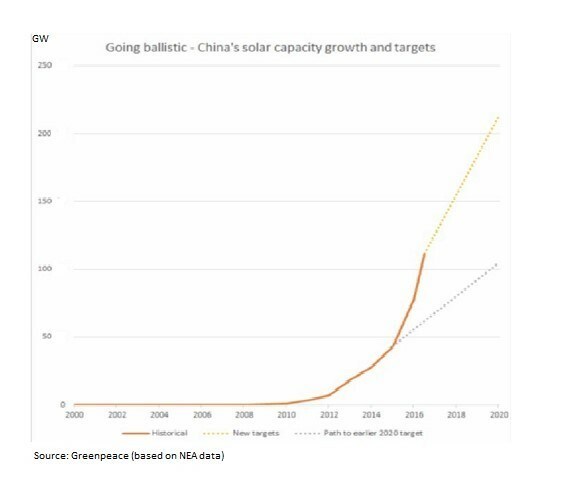 Now the NEA in China in August has acted to raise the target for solar PV power in China by 2020, setting a new target of 213 GW – doubling the previous target total, which is already five times the current installed capacity in the US – see here. This means that the AECEA projected target for 2020 is in line with official Chinese targets. Greenpeace also notes that China plans by 2020 to have installed no less than 54.5 GW of large-scale solar projects, encompassing Concentrated Solar Power (CSP), solar PV and combinations of solar and food production systems – see here. Greenpeace capture the situation with solar PV as shown in Fig. 2. The 6.0 GW new capacity added for wind in China for 2017 (1H) – or 1 GW per month (equivalent to 400 new turbines built and erected, rated at 2.5 MW each). This is a 4.7% increase on the pro rata figure for 2016, which saw wind capacity additions reaching 17.3 GW, and the cumulative total reaching 154.6 GW, easily the largest in the world. According to Greenpeace, China is on track to install 110 GW onshore wind capacity by 2020 – raising cumulative wind capacity to 259 GW, well in excess of the 210 GW target set for the end of the 13th FYP period in 2020. The situation for wind power capacity and generation is depicted in Fig. 3. 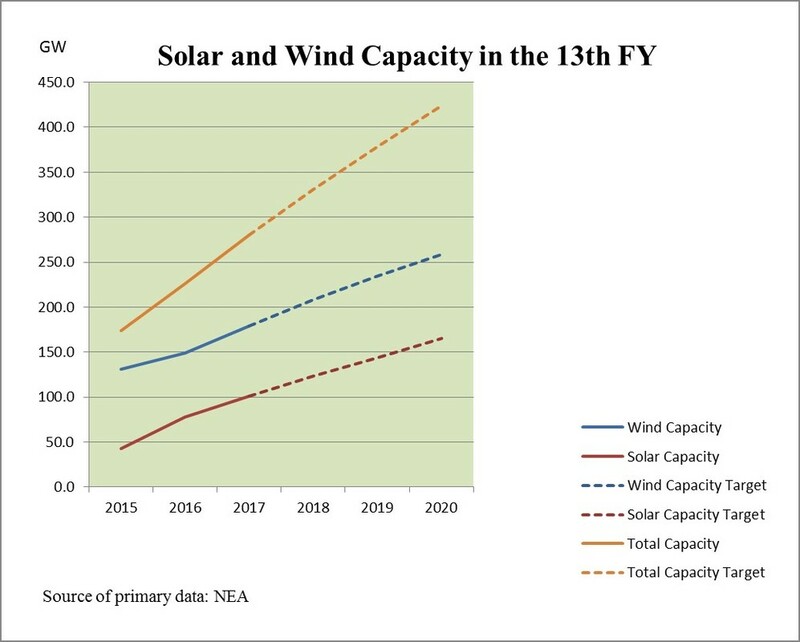 The total solar and wind capacity would exceed 400GW by 2020, according to the latest NEA plan, as shown in Fig. 4. Figure 4. Solar and wind capacity in China’s 13th FYP. Meanwhile hydro continues to expand at a moderate rate in China, with the 5.6 GW capacity added in 2017 (1H) representing a 28% increase on the pro rata figure for 2016 of 4.37 GW new capacity additions. The cumulative total for hydro at the end of 2017 (1H) stood at 340 GW, meaning that China has already installed hydro to the target level for 2020. This must be close to the absolute limit for China, given that there is a natural limit to the widespread damming of rivers, nearly all of which are already fully dammed. There is a major struggle now under way in China between the interests backing renewable sources (mainly hydro, wind and solar) and those continuing to support thermal sources for power generation (mainly coal but also gas and a very small amount of oil). China’s problem is to allow the renewable sources to grow while reducing the activities of the thermal power sector in a socially responsible way. 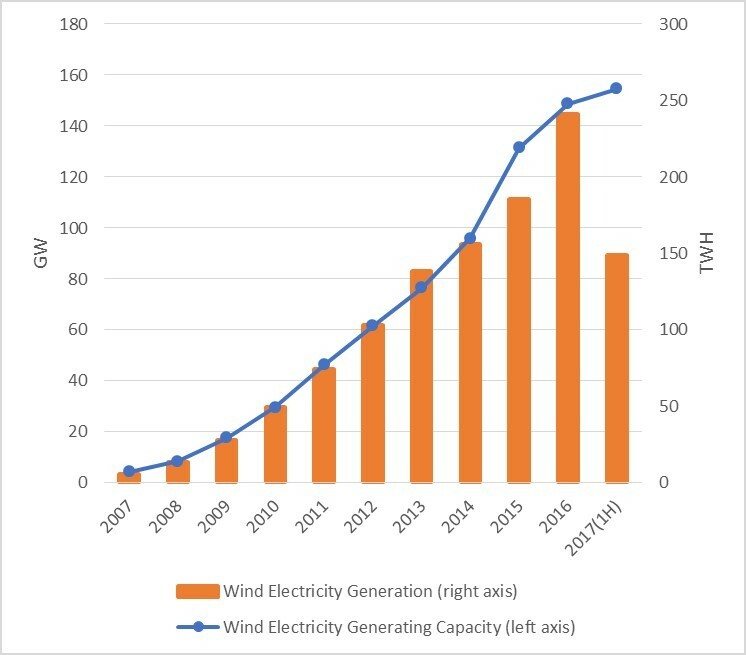 China’s total power system has moved in a steady green direction, with the proportion accounted for by WWS sources growing from just 20% in 2007 to 35% by 2017 (1H), as shown in Fig. 5. This 15% swing in favour of WWS sources in just a decade is a truly extraordinary shift in the largest electric power system in the world. At this rate, China’s electric power system will be expected to reach 50% green capacity (WWS) within another decade, by 2027, i.e. well before 2030. Carbon emissions will be expected to fall accordingly. Figure 5 also includes the proportion of WWS anticipated by 2015 in the 12th FYP – already exceeded in the 2015 results. 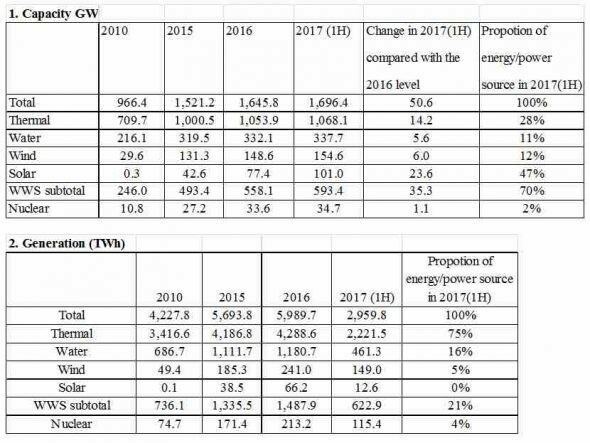 During the first half of the 13th FYP, running from 2015, 2016 and 2017 (1H) (Table 2), new capacity of 152.4 GW based on thermal sources was added as against 169.2 GW for renewable sources (hydro, wind and sun). So over this period new WWS capacity surpassed thermal sources by 11%. The advantage in favour of WWS sources was even greater when examining investment. In fact investment in thermal sources over the first half of the 13th FYP accounted for RMB 265 billion, as against RMB 450 billion for WWS, or WWS exceeding thermal investment by 70%. 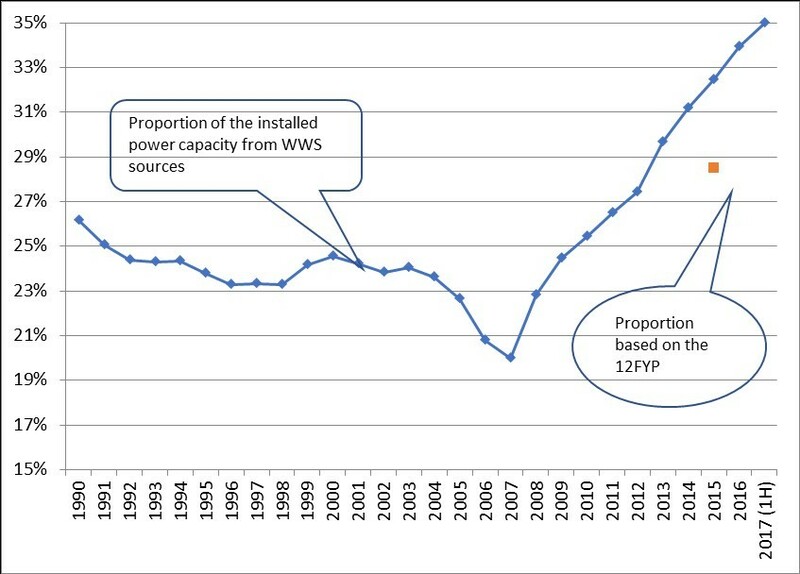 Over the same period of the first half of the 13th FYP, WWS sources accounted for 55% of the new capacity added – making it clear that the trends revealed in Fig. 5 may be expected to continue. However in terms of actual electricity generated over the first half of the 13th FYP, thermal sources amounted to 10,696 TWh, as opposed to 6,446 TWh for WWS sources – with renewable (WWS) accounting for just 32.2% of electric energy generated from thermal sources. This underlines the fact that China’s electric power system is still a large coal-fired system. There are some negatives to set against all these positives. Apart from the continued burning of large volumes of coal, leaving China with the world’s leading greenhouse gas emissions, if only a fraction of US emissions in per capita terms, there is the issue of curtailment, or failure to connect wind and solar power farms to the grid with the result that China is presently generating unused electric energy. Greenpeace notes that in 2017 (1H) the national wind curtailment rate stood at 13.6%, and solar curtailment in five northwest provinces at 15.5%. Curtailment refers to power generated from renewable sources that is not fed into the grid, either because the grid cannot accept fluctuating sources of power or the grid operator refuses to accept the renewable power. The NEA acknowledges the problem, and has announced steps to deal with it. First, the NEA has ruled that provinces with serious wind and solar PV curtailment problems (such as the western provinces of Gansu, Xinjiang and Ningxia) may not install any more new capacity. This would have the effect of nudging these provinces to make better use of the capacity already installed. Second, the NEA identifies seven provinces (including Beijing and Shanghai) as being released from controls and becoming free to add as much solar capacity as they wish, subject only to the constraint that they must not make the curtailment problem any worse. See here. John A. Mathews is Professor of Management, MGSM, Macquarie University, Australia, and formerly Eni Chair of Competitive Dynamics and Global Strategy at LUISS Guido Carli University in Rome. His research focuses on the competitive dynamics of international business, the evolution of technologies and their strategic management, and the rise of new high technology industries. 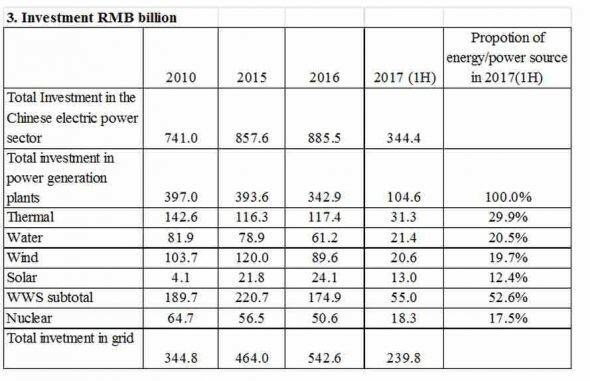 1 It is worth noting that different definitions of ‘clean energy’ can lead to varying estimates of China’s green shift. For example reports in the China press in July that China’s ‘clean energy’ generation in 1H 2017 reached 27.2% of total power generation are at variance with the estimates given here (see for example , ‘China’s clean energy generation accelerates in first half’, China Daily, 19 July 2017). The estimates cited here are based on CEC data and a characterization of ‘clean’ as meaning energy generated from WWS sources.